Favorite Christmas carols from a variety folk traditions, perfectly paired with fiddle melodies new and old. Offers rich harmonies, uplifting energy, and calm reflection for the holiday season. 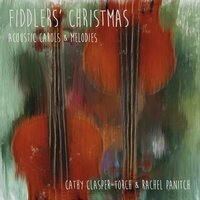 Cathy and Rachel have brought together their favorite carols and melodies, pairing them with original and traditional fiddle tunes. This album is both an uplifting and reflective musical collaboration between musicians Cathy Clasper-Torch (fiddle, piano, cello), and Rachel Panitch (fiddle, mandolin, percussion). Cathy Clasper-Torch (violin/fiddle, piano, erhu, cello) has been playing, teaching, recording and performing in RI and New England for over 25 years. Cathy combines her love of all genres of music from world-folk to rock to jazz and classical in her playing and improvising. Cathy's particular passion is in blending and harmonizing, both vocally and instrumentally. Cathy's collaborated with a wide variety of groups and musicians over the years, and is on over two dozen recordings. She performs regularly with The Gnomes Band and Atwater~Donnelly, as well as other local bands, and performs solo (or duo/trio/band) for weddings, services and other special events. Cathy is also a member of Grace Note Singers, who offer bedside singing to people receiving palliative care or nearing death. Cathy teaches 5 levels of adult group fiddle classes at the Blackstone River Theatre in Cumberland, RI. Rachel Panitch is a Boston-based violinist, improviser, composer, and teaching artist. She has been an artist-in-residence in neighborhoods, in schools, and in Zion National Park. Rachel uses her violin and voice to tell and translate stories. Her playing has been called “fearless” and brings together aural and written musical traditions. Rachel performs Classical music with the Cardamom Quartet, is a dance fiddler with French Roast, and weaves stories with Thread Ensemble (an improvisatory trio of violins, voices and vibraphone) and with Grammy award-winner Bill Harley. Rachel’s fiddling can be heard on a PBS Utah Bucket List episode, and The Mosque in Morgantown, an Emmy-nominated PBS documentary soundtrack. Rachel specializes in teaching improvisation and fiddling, and works regularly with a number of music education organizations and schools around Massachusetts and Rhode Island. In 2009, Rachel founded Rhode Island Fiddle Project, a free music program teaching traditional fiddle and dance music to students ages 7-17. Rachel continues to work with nationally-recognized Community MusicWorks in Providence, RI, where she completed a Fellowship that inspired and incubated RI Fiddle Project. She was chosen as a 2015-2017 Jubilation Fellow, a national award recognizing “individuals with an exceptional talent for helping young people feel fully alive through rhythm." Rachel received her Masters of Music in Contemporary Improvisation from New England Conservatory, and holds a BA in Anthropology from Vassar College.